Hey guys, so here’s a quick and easy Flash Giveaway. 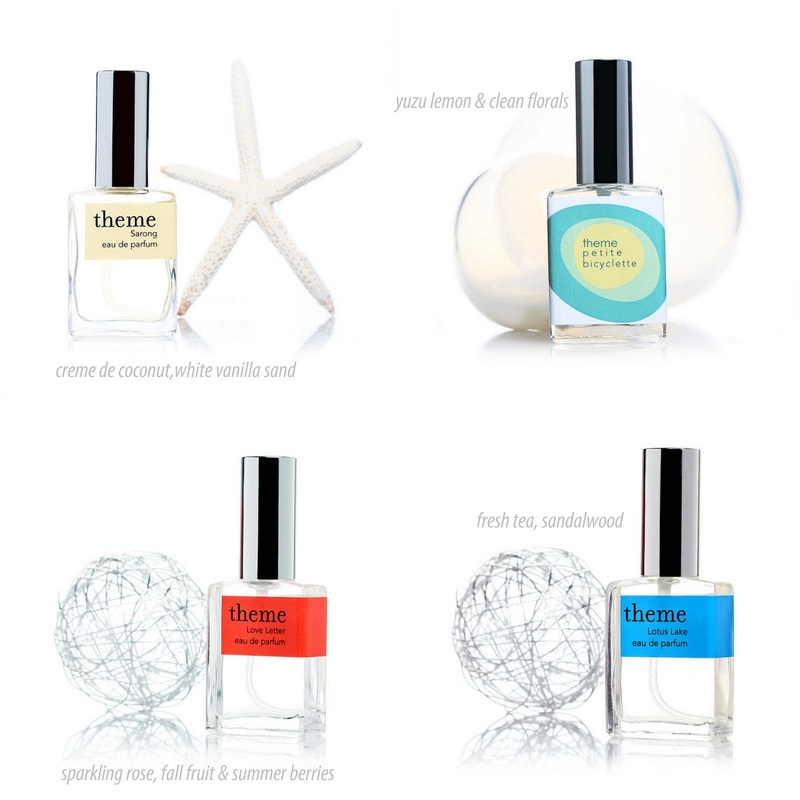 After featuring one of Theme’s fragrances in my citrus scented fragrance selection last week, they kindly agreed to giveaway one of their perfume sprays. If you know nothing else about Theme, just know this, they are definitely one of the best at what they do and their reputation extends beyond just the Etsy community. You’ll be winning an excellent product and I won’t even go into the rave reviews their customers have left behind; you can find those on the feedback from their page. Founder and Creator E. Morrison designs the Theme line in New York. She’s actually a professional photographer with a passion for fragrance and skincare. Her pictures have been published editorially in magazines such as Vanity Fair, Rolling Stone and Paper Magazine and she has shot visionary portraits of personalities such as Madonna, Daniel Day Lewis, Debi Mazar, Natalie Merchant, Philip Glass, John Mellencamp. From super accomplished photographer to self-taught perfumer. I just love stories like these. So how do you WIN. Simple, lets make this one fun. Using E. Morrison and her multi-hyphenated career (Photographer-Perfumer) as a starting point, if you could be anything else or do anything else than what you do now, what would it be. Don’t be shy…skys the limit. I’ll go first. I would be Attorney-Head of Programming HBO. If you can’t dream… what can you do? Is it wrong that I also want to be Attorney- Top Chef Judge. I’m just being greedy now. Your turn. You have till end of business FRIDAY, let’s just make that MIDNIGHT. UPDATE: This is turning out to be one of my fav giveaways, having so much fun reading the comments. For that reason, there’ll now be 2 WINNERS. Keep them coming…thanks guys for participating. Hmm…I would be food critic – brewer. If the "sky's the limit", World Class Belly Dancer-Lingerie Model. If I could be ANYTHING in the world right now I would want to be a wizard who lives a seemingly boring life in the real-world under the guise of a knick-knack shop owner but whose store is actually a portal for magical creatures. I would be a bookstore owner food critic! A writer. A real, live writer. This giveaway is amazing… fingers crossed that I get lucky! I always wanted to study Medicine, either regarding people or animals. I would love to (someday) be a wise old shamanic medicine priestess~ guiding and healing those in need with extreme skills in organic botany, matched with highly intuitive aura/chakra readings. Thanks for this one – it was really fun! i would be a Baker-Bounty Hunter, lol! How fun!!! I would be a antiques shop owner! I love to touch things with history to them and those little vignettes seem so much fun to create! I love this giveaway because it's actually fun! I would be a world renowned flute performer who travels the world – cupcake shop owner – zookeeper. I would be an accessories and home decor products designer as well as a few lance photographer. I would b the queen of this country (SWAZILAND) there is so much that is not going well in this country poverty, HIV/AIDS. I would be a traveling poet + leading child psychologist who fixed issues without drugs! I would love to be an interior designer-jewelry designer. I'd love to create spaces and design pieces that my clients would brag about owning. Stay at Home Mommy-Counseler for Hearing Impaired children and adults. My dream job! If i could be ANYTHING i would be a furniture queen–recovering, painting, salvaging, and repurposing. I would have a big warm warehouse and i would work on my crazy projects all day! Hello……I would love to be a Nurse Practitioner (sans my fear of blood) who moon lights as a Plussize image/fashion stylist for the everyday Fluffy-Plussize women whom haven't found their essence. If I could have the actual talent to go with it, I'd love to be on Broadway or just musical theater, since i'm a huge fan. With the bit of talent I have, I'd love to be a published author…and successful at it! OOOOO! This is such an interesting excercise! I am going to go all out and put everything that has crossed my mind as of late. Wonderful and supportive mom-wife-daughter-sister-aunt-friend/philanthropist multi-billionaire entrepreneur/homeschooler/jewelry-clothing designer/world traveler/natural hair boutique-salon owner/natural hair product manufacturer/nurse practitioner/holistic health provider. That was really fun! Thanks for providing the opportunity for a bit of mid-week daydreaming! I would be Non-Profit Chief Operating Officer-Executive Chef! I would love to help run a non profit someday but I also love to cook! I would be an Actress-Cosmetic Surgeon Thanks! Sky's the limit? I would be a Top Celebrity Wedding Photographer or Director of Promotions for the CW! I'd love to be physician-Martha Stewart crafter! I would design window displays at really artsy stores. And train seeing eye dogs on the side. If I wasn't a wife and mother, I would want to go work/help in orphanages in the world…to show children love and kindness does exist! Crunchy Green Mom - Suzanne B.
I'd be a cultural anthropologist (if that exists)/ photographer & a fashion stylist/ designer. whale rider – working actor! I'd be a grammy award winning singer – a dream that was dashed when I recorded myself with a cassette tape and did a playback…could not believe how awful I sounded when I thought I was such a great singer. Just kidding, I would be attorney. Right now I am a college student. I would be an Entertainment Lawyer for Beyonce, Jay Z and Kanye West! RIGHT NOW! I'd be a film and television actor and I want to be on GLEE! Remember this day cause I'm gonna make it happen. I would be a special education teacher and photographer. I would be a culture experiencer!!! see thats not even a real thing or at least i dont know the real name for it. but i would travel all over the world, expereince the different cultures and lifestyles of people all over the world and document it in pictures, words, poems whatever way i could. Ooouuu. I'd be a Travelling Counselor-Yoga teacher-Dancer-Model. Fun times! Geologist/jeweler/ecologist/roller derby star/traveler/master pastry chef. I think I would be okay with that. I would be a Media Specialist/Cookie Maker. I love to bake and try new recipes, especially cookies. I would want to be a pilot and a food critic. Traveling and seeing breathtaking sights PLUS eating. My life would be amazing. Genius billionaire playgirl philanthropist/Iron Woman minus the Daddy issues. Hey, you said the sky was the limit! I would be a Travel Writer. Mixing two of my loves, writing and traveling into one career. Social Worker-Race Car Driver! Ultimate dream job! I would like to start a non profit organisation in Africa which helps people develop their skills to better themselves. I just think Africa as a whole needs more skilled workers. I would be a jewelry and shoe curator for Lucky Magazine. I would love to spend my day bringing joy to others through fashion the same way the pages of magazines and styles bring me joy. Flipping through those pages is my way to escape the daily grind. I would enjoy using my imagination to bring all of these colors and shapes, textures, styles to others who look at fashion as their "escape"..so being apart of that would be awesome. World Banker- Farmer. Absolutely love to garden and grow fruits and veggies! Psychologist-Street Style Photographer ( US & Europe ) Uplifting people all over the world with my photos. I would be a non-practicing attorney (I worked hard, I need that "Esq." even if I don't use it! )/published writer/traveling yoga teacher/interior designer.